Dynamic warm-up: high knees, open/close the gate, high kicks, and end with full shooting form. Start with easy strike throughs with quick pass, trap and shooting. Follow your pass to where the goal is shown and receive the next shot from the person behind you. -master quickness and power of shooting. Work on quick release of shot after trapping. 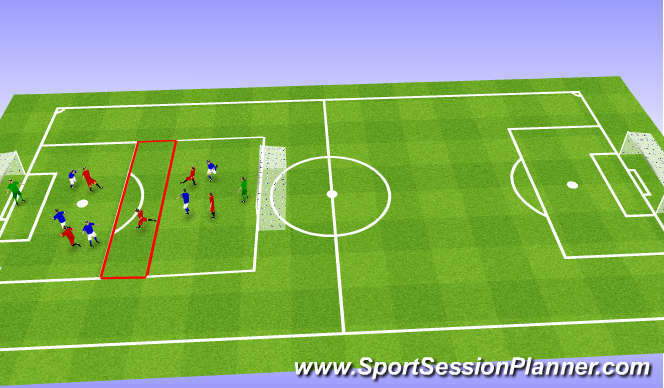 Cone 1(1C-1P) coach passes to shooter who takes immediate shot - no trap. Cone 2(2C-2P) shooter traps and immediately shoots - focus on proper first touch, footwork to prep for shot and quickly getting the shot off. Cone 3(3C-3P) through-ball is played to running shooter, outside of right foot touch into space, shoot on the run. 1v1 fast break attack to goal. Attacker immediately becomes defender after the play finishes. Defender gets ball. 3v2 in each grid with a 7-yard buffer zone where defenders cannot enter. Defenders pass the ball up to the point forwards, who lay the ball off for defenders to shoot.